A laser produces a beam of highly concentrated light. The light emitted is well absorbed by the pigment located in hair follicles. The laser pulses for a fraction of a second, just long enough to vaporize the pigment, disabling numerous follicles at a time to eliminate or significantly impede the hair's growth. Dr. Smith uses the highest technology lasers with unparalleled treatment efficacies in hair removal, especially thinner hairs that other lasers simply cannot target. 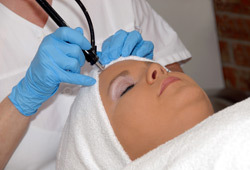 Although the FDA has approved several types of laser for permanent hair reduction, results can vary. An individual's metabolism, hormonal level, hair quality and number of hair follicles can all affect the outcome. Moreover, normal hair goes through a growth cycle in three stages: the anagen, or growing phase; the telogen, or resting phase; and the catagen, or transitional phase. During the anagen phase, hair is susceptible to the laser's energy, but during the telogen and catagen phases, it is resistant.